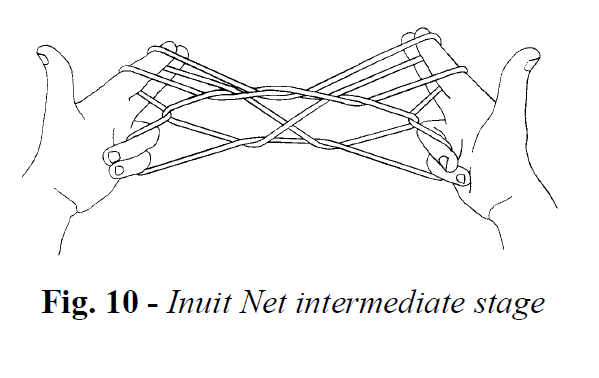 The finishing moves of the Inuit Net sequence are two very unusual weaves which i call “fixing the bottom” and “cleaning the top.” In the Inuit Net sequence, these weaves are applied to a partially woven figure of considerable complexity (fig. 10). Note carefully the positions of the two transverse strings. In fig. 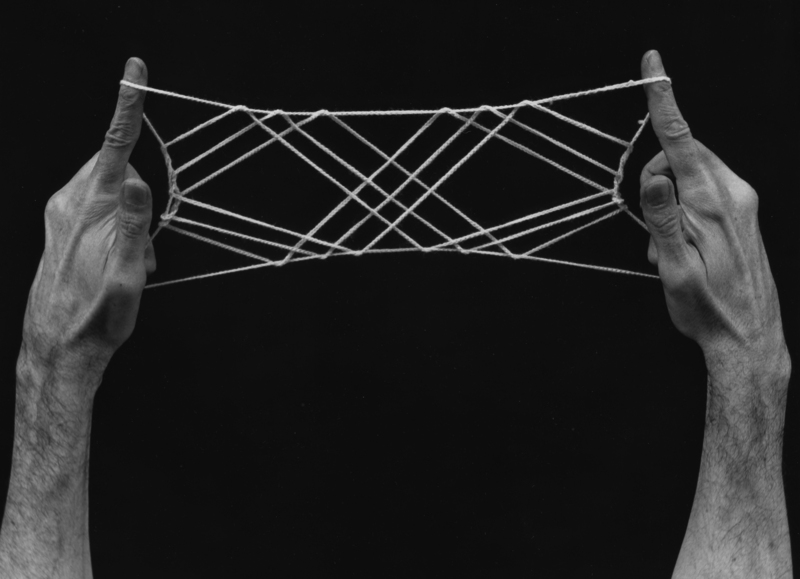 10, these are the upper near index string (top transverse) and the far little finger string (bottom transverse). 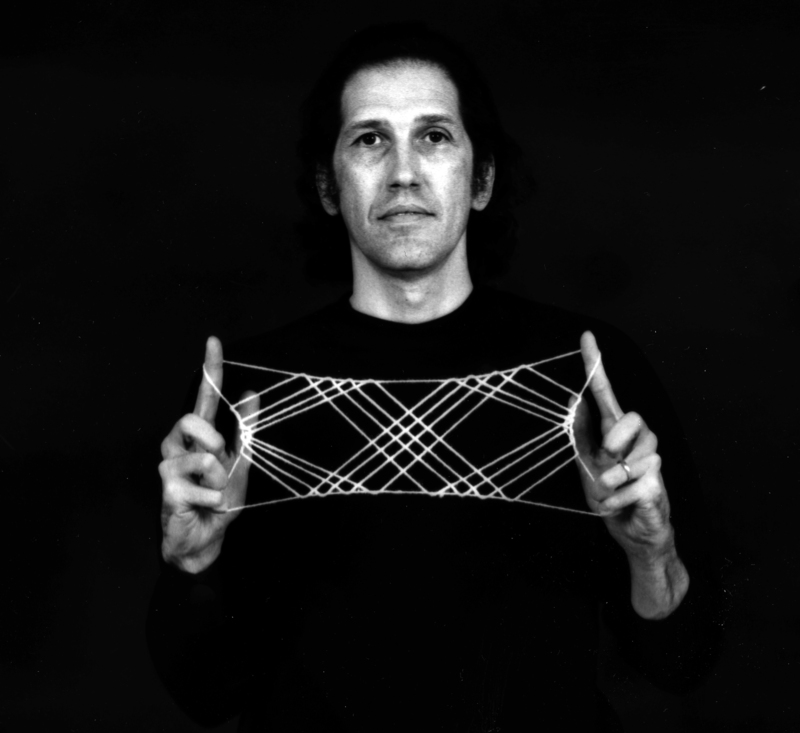 In many string figures transverse strings become the frame strings of the final design, and for this reason their relative positions during the weaving sequence are important. In the “fixing the bottom” weave, the “bottom” transverse string is drawn through the upper index loop. In the “cleaning the top” weave the top transverse is drawn through the lower index loop (after both are transferred to the thumb!). What would happen if these two weaves were applied to a greatly simplified version of fig. 10? 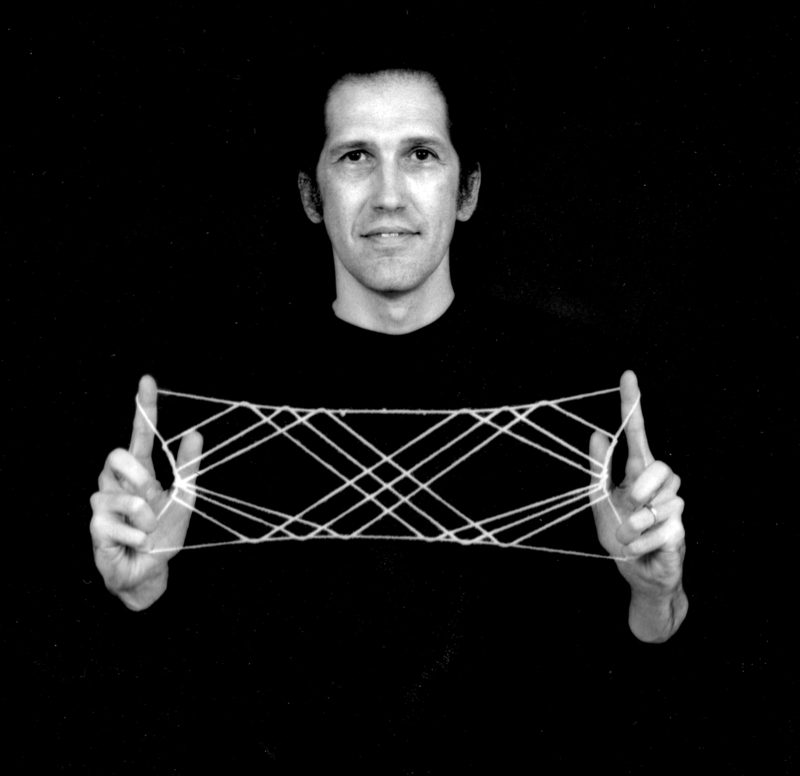 A valid string figure should result if three features are present: (1) a transverse upper near index string; (2) a transverse far little finger string; and (3) a lower index loop. The simplest string configuration with these features is shown in fig. 11. 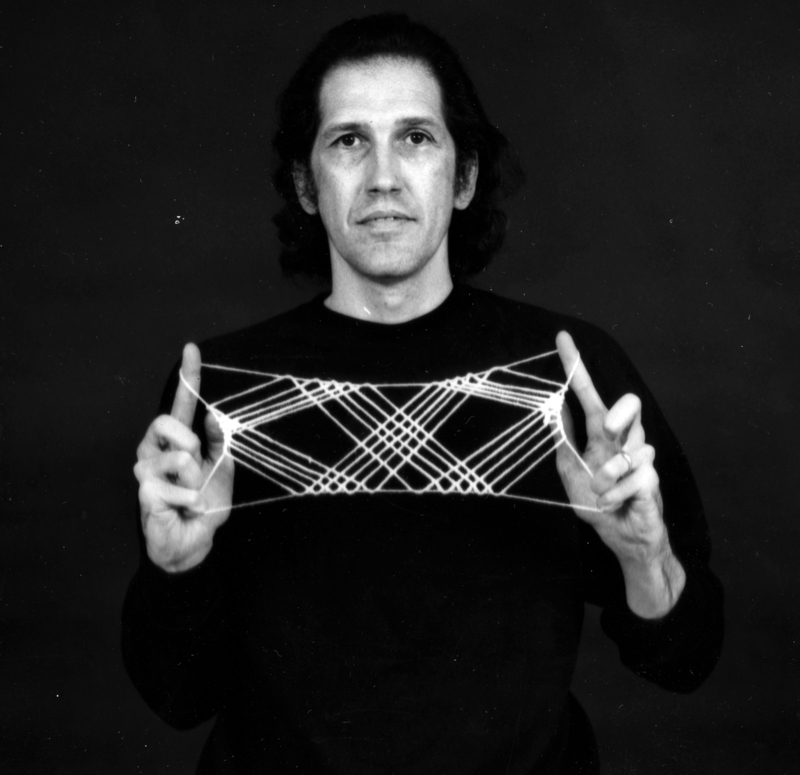 Begin with a 3-loop L-DNA loom. Transfer the thumb loop to the top of the index, inserting the index finger from below. Create another index loop as follows: Insert the left thumb, from above, into the upper index finger loop and return with the upper near index string (rotate the left thumb toward you and up); insert the right thumb, from below, into the left thumb loop and extend. Now transfer the thumb loop to the top of the index, inserting the index from below. Using this procedure, create as many index loops as you like. In this example the procedure is done only once. Pass the thumb under the index loops, transfer the little finger loop to the thumb, then immediately retransfer this loop to the middle-ring-little fingers, inserting them from above and pressing their tips to the palm. This completes the vertical loom. 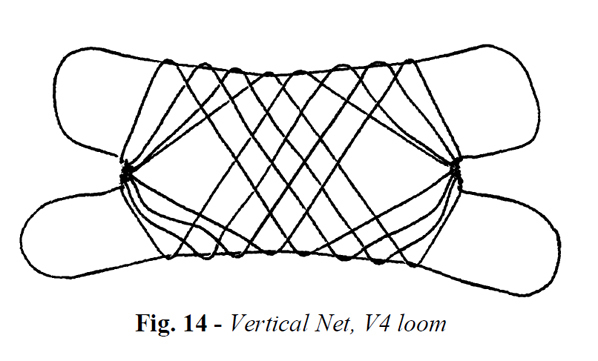 Since there are three loops on each index in this example, V3-Loom is an appropriate abbreviation (figure below). 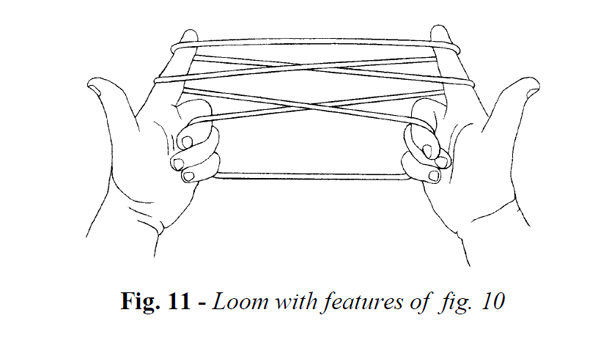 With each thumb hook down the lowest far index string and draw it down through the middle-ring-little finger loop until the thumb is below the far little finger string (fig. 13B below), then with each thumb pick up the far little finger string and draw it through the loop on each thumb, which slips off as you return. Drop the middle-ring-little finger loop and extend (fig. 13C). Transfer the thumb loop to the middle-ring-little fingers by inserting the three lesser fingers from below, closing the near thumb string to the palm, and withdrawing the thumb (fig. 13D). 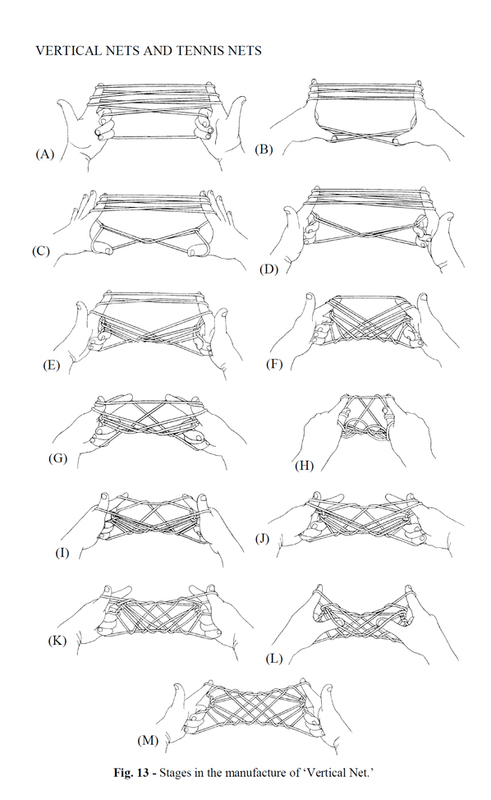 Insert each index, from above, into the upper and upper-minus-one thumb loops, pick up the upper-minus-one near thumb string, and draw it through the upper thumb loop (fig. 13G); then curl the tip of each index around the upper near thumb string, drawing this string away from you and up through the index loop, which slips off (fig. 13H). Drop the upper and upper-minus-one thumb loops and extend (fig. 13I). Transfer the index loop to the top of the thumb, inserting the thumb from below (fig. 13J). Repeat the V-2 sequence until only one thumb loop remains. In this example, V-2 is done a total of two times (see figs. 13J, and 13K). To free the thumb, retransfer the thumb loop to the index, inserting the index from below. 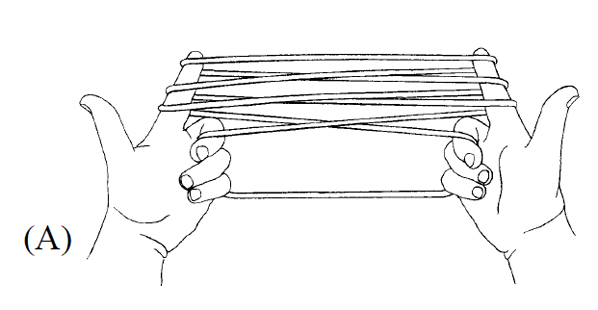 Insert each index, from above, into the upper and lower thumb loops, pick up the lower near thumb string, and draw it through the upper thumb loop; then curl the tip of each index around the upper near thumb string, drawing this string away from you and up through the index loop, which slips off. Drop both thumb loops and extend (fig. 13M). where n = the number of index loops in the initial Vertical Loom and superscripts indicate how many times the bracketed sequence is repeated before advancing to the next weave. The result of n = 4 is shown in fig. 14.